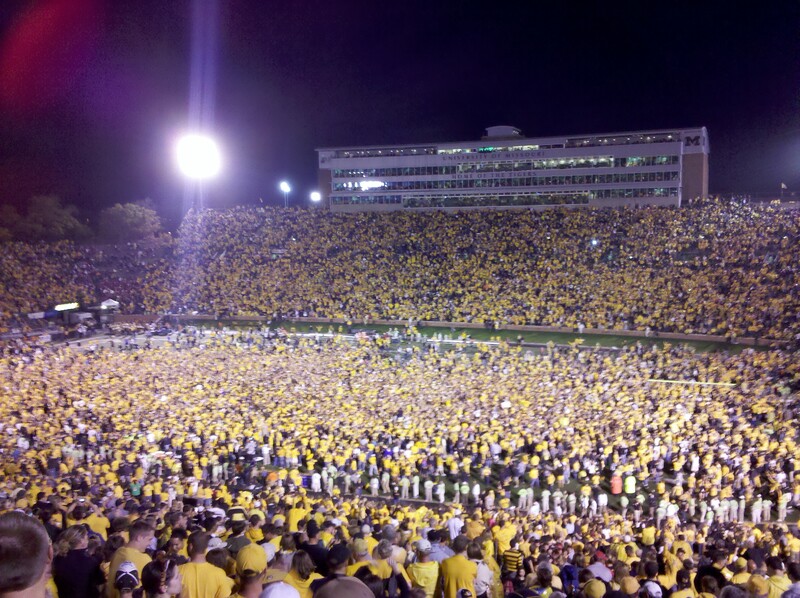 mizzou | we got us a family here! 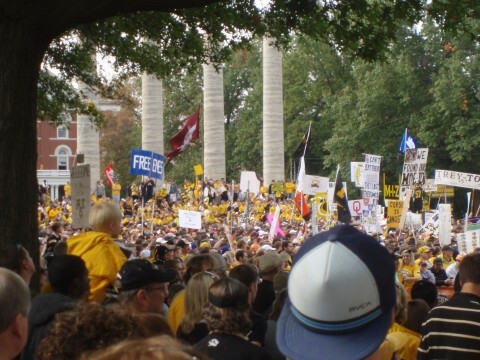 For 100 years Mizzou has been celebrating homecoming. We’ve been a part of that celebration for the last 12 years. Our kids have been a part of it for the last 4. 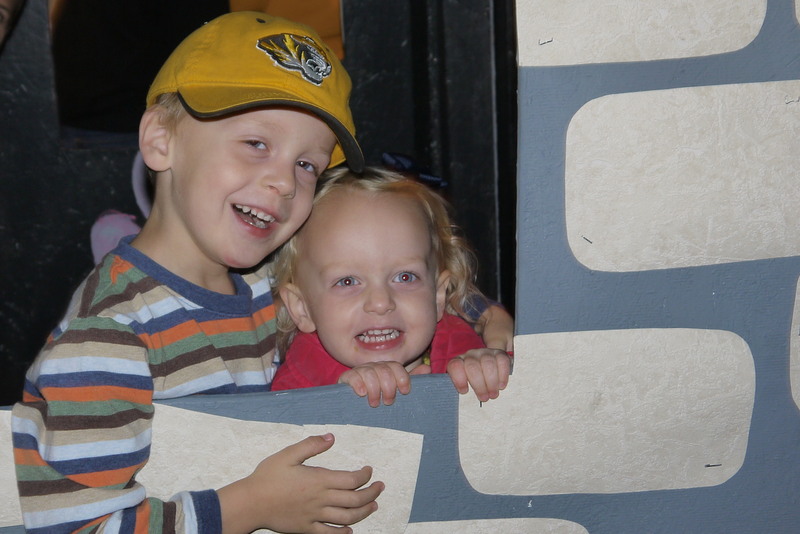 We headed down to Columbia last Friday night and got there in time to take the kids to Greektown to see House Decs (or house decorations if you don’t know the lingo). 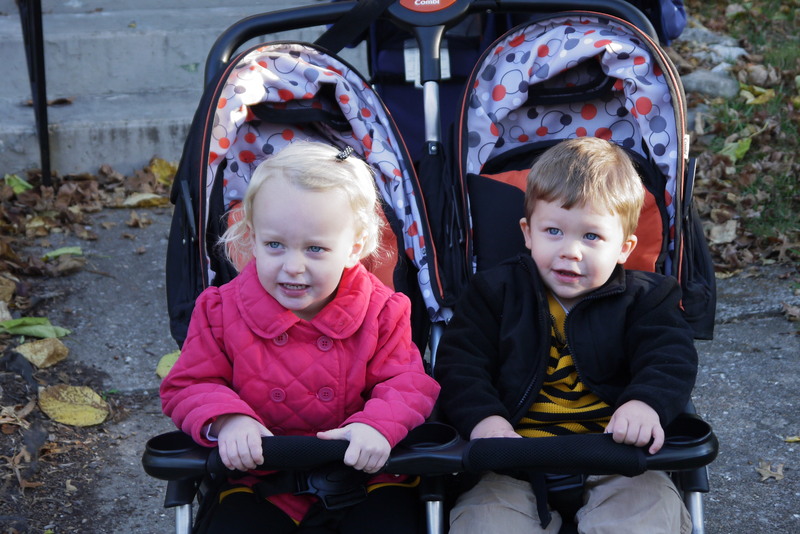 The weather was awesome and the kids loved getting to hang out with their buddies, Harrison and Henry. They had fun watching the different fraternities and sororities do skits. 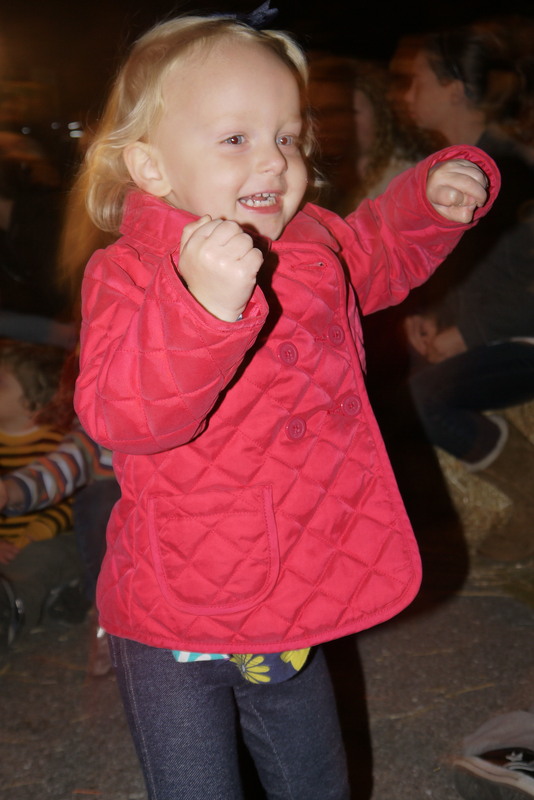 Molly loved all the music and danced like crazy. We saw Trav’s cousin, Cori, and her roommate, Amanda, at house decs and they graciously shared their popcorn with the kids. 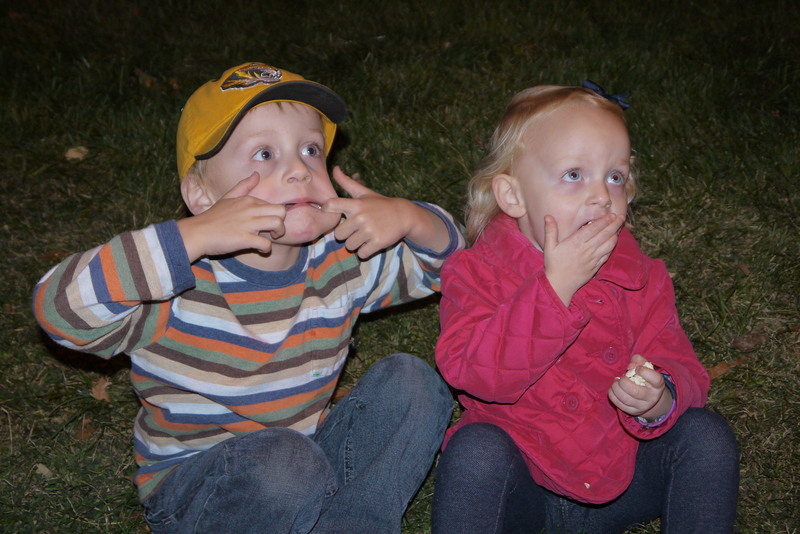 Molly couldn’t get enough, and Owen just didn’t want to get his picture taken. While we were wandering around Greektown on Friday, we stopped by the Pi Phi house to see all the remodeling that’s been going on. The kids loved the house because the girls gave them cookies. 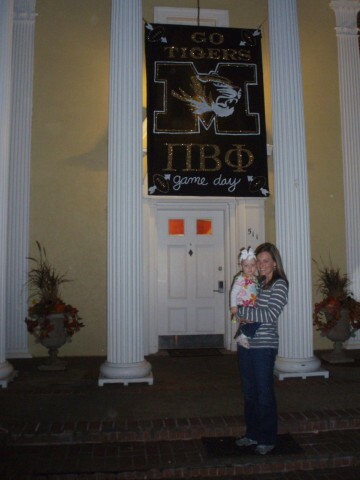 I’m not against it if Molly thinks being a Pi Phi would be pretty fun. No pressure or anything. 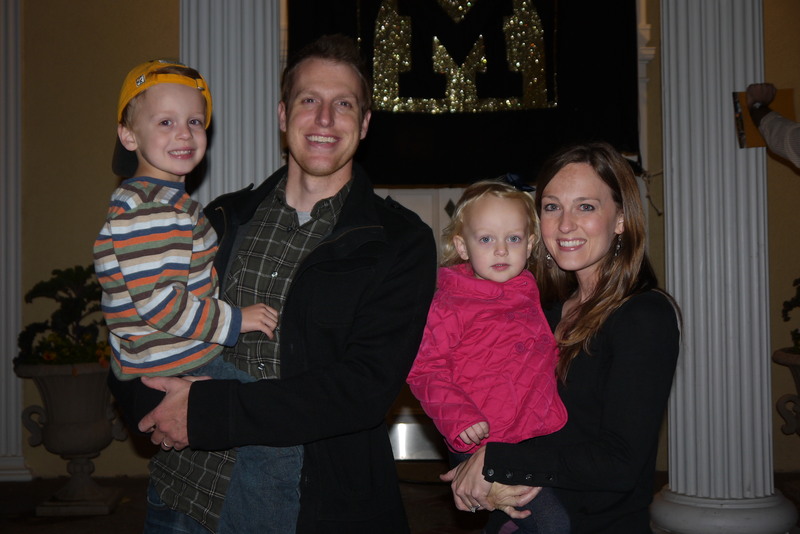 And a decent family pic in front of the house. Thanks Cori! 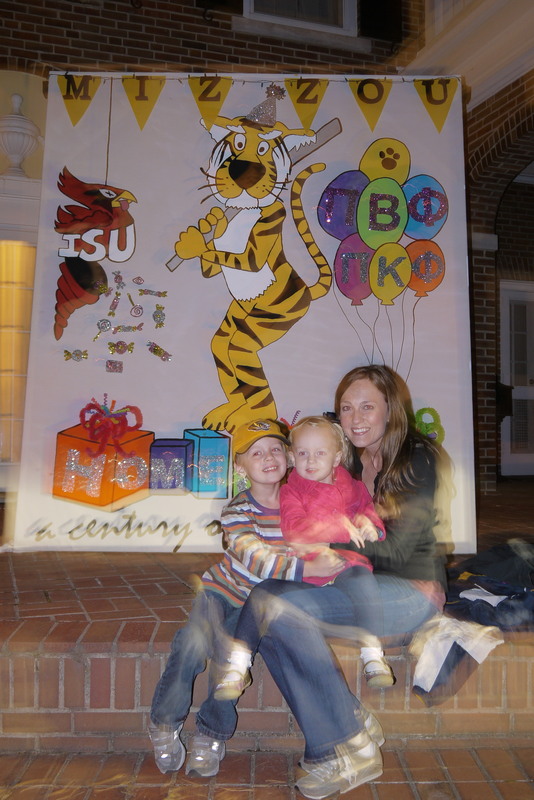 After we had our fill of house decs, we headed back to Abbey and Scott’s to watch the Cardinals in the playoffs. But not before we took a quick detour through campus. 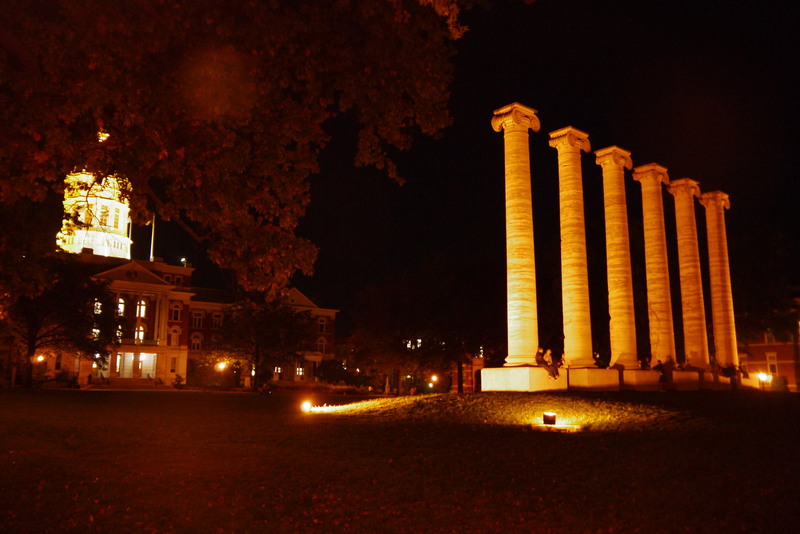 The columns at night are so so pretty. Owen and Molly were fascinated with them…although Owen kept worrying that they were going to fall down. 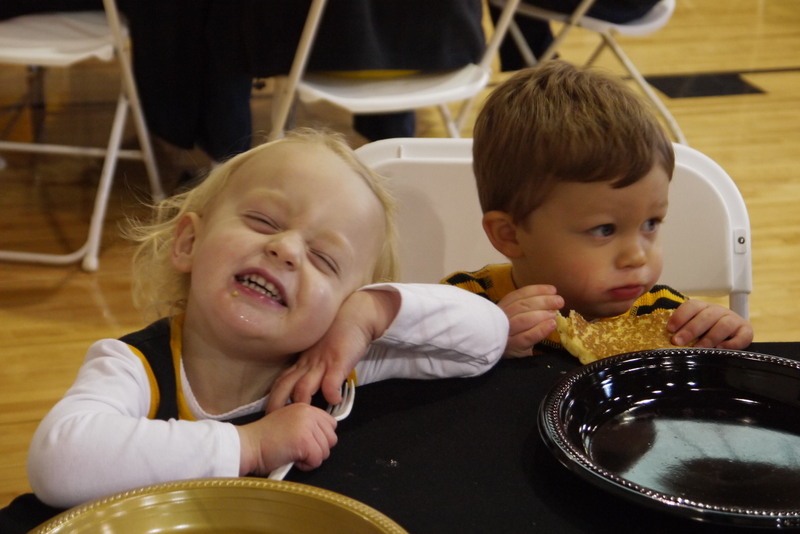 Every year before the parade is a free pancake breakfast for alums. We got filled up on pancakes, cider and sausage before heading out to find a spot to watch the parade. Henry and Molly, with her goofy cheesy grin. Crazy girl. 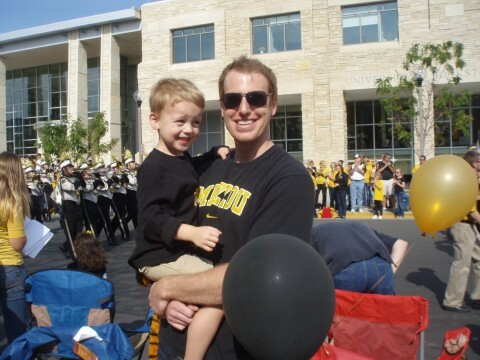 The parade was so much fun this year. Last year the only word I’d use to describe the parade would have been STRESSFUL. 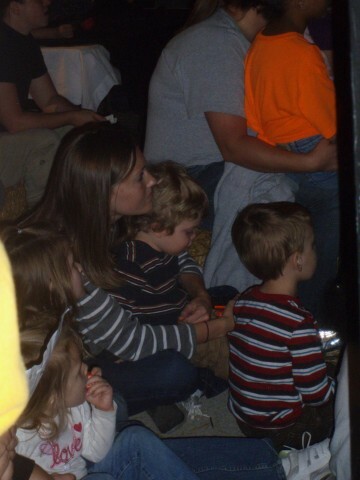 Molly was a crazy toddler who had no interest in sitting and watching anything. We spent the whole time chasing her through crowds of people. This year was SO much better. 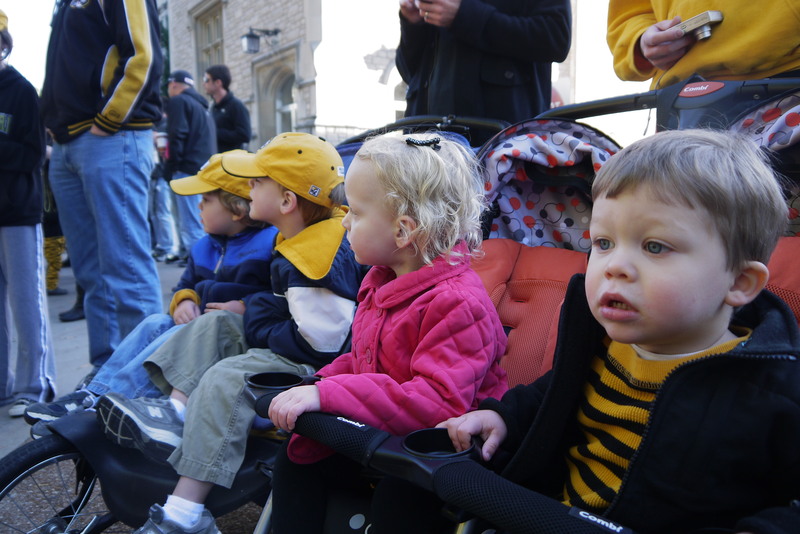 The kids even watched a bit of the parade from the comforts of the strollers. 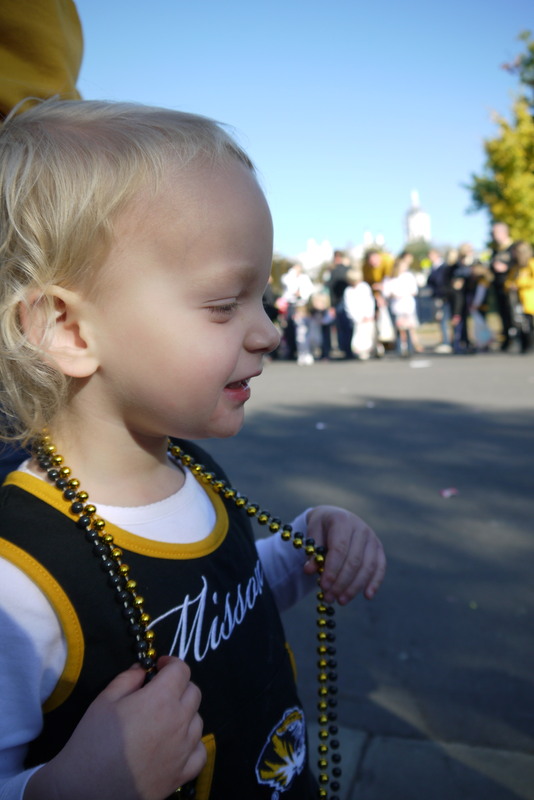 The kids loved the bands, the floats and the firetrucks…but mostly they loved the candy. And the beads. 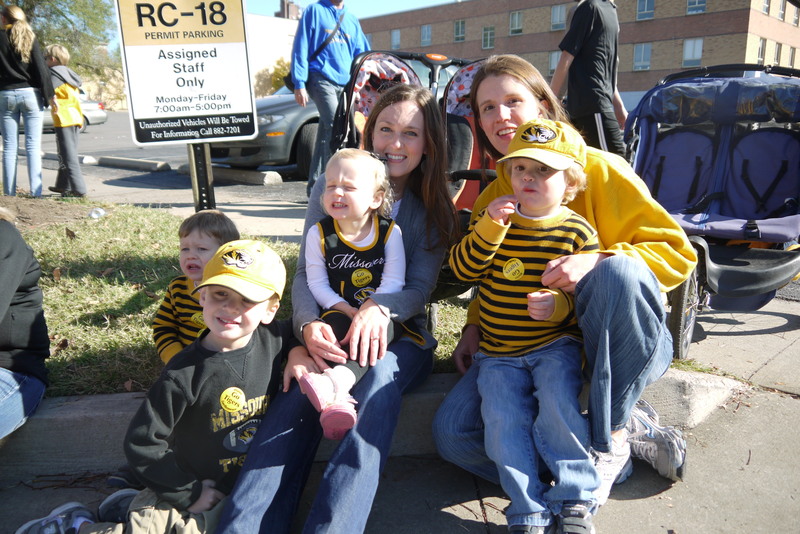 The kids loved watching the parade. I loved the time to hang out and catch up with Abbey. 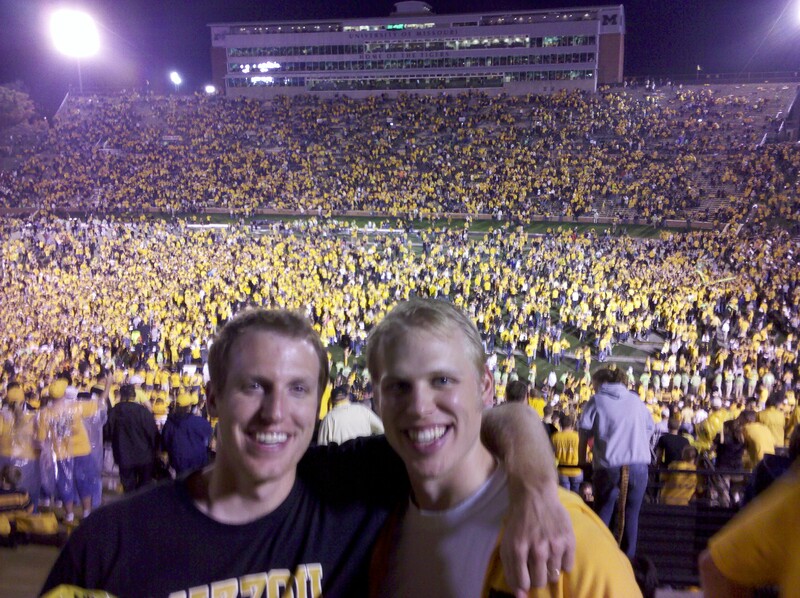 We didn’t go to the football game…the big reason most people go to Homecoming weekend! But we left in time to listen to it on the radio. 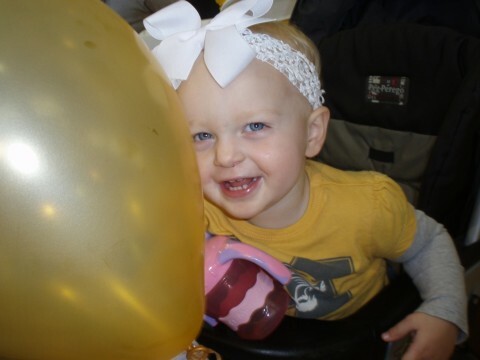 A football game with Molly didn’t sound like the best use of our money! 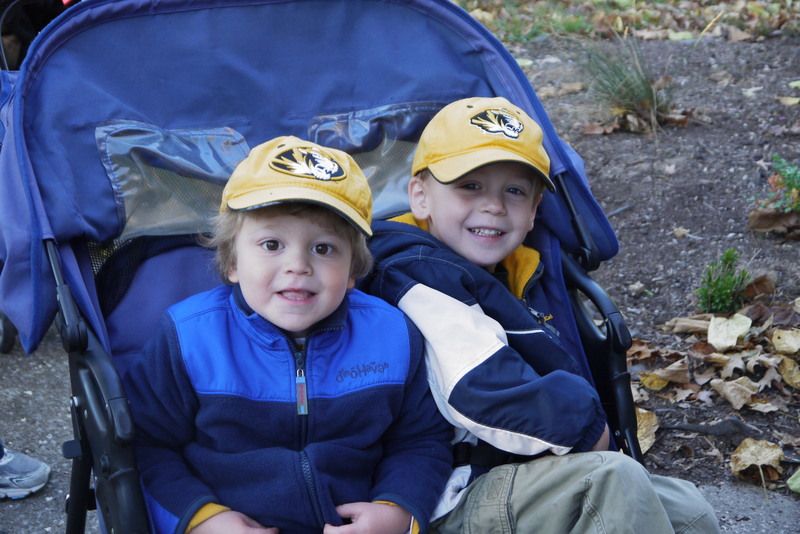 We are headed back to Mizzou this weekend to see the Oklahoma State/Mizzou game. 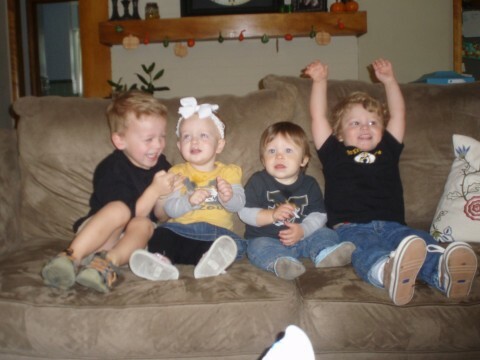 We’re pumped and ready for a good game! 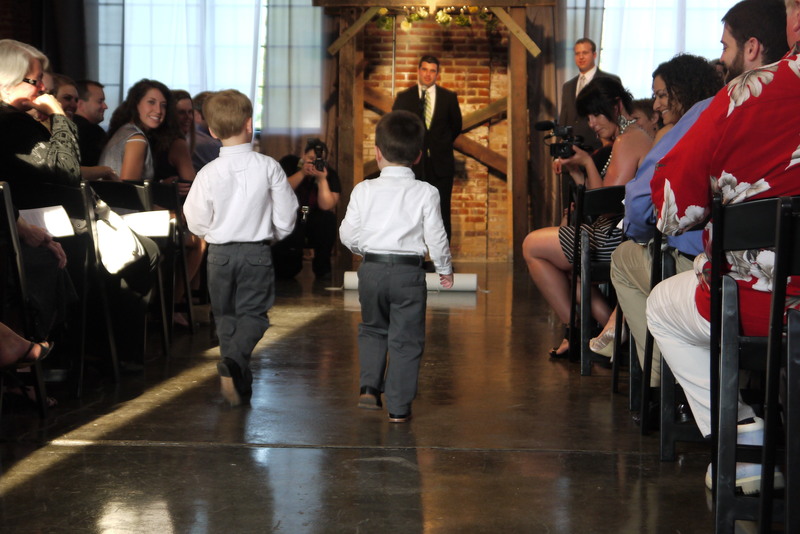 We were sure we’d be helping them down the aisle…but more about that later. After the rehearsal we took a few minutes to check out the crazy pictures booth that was set up for the wedding the next day. Pretty awesome family pic, huh? You can’t see my hat very well, but it said something about a Redneck and had a mullet attached to it. Fantastic. 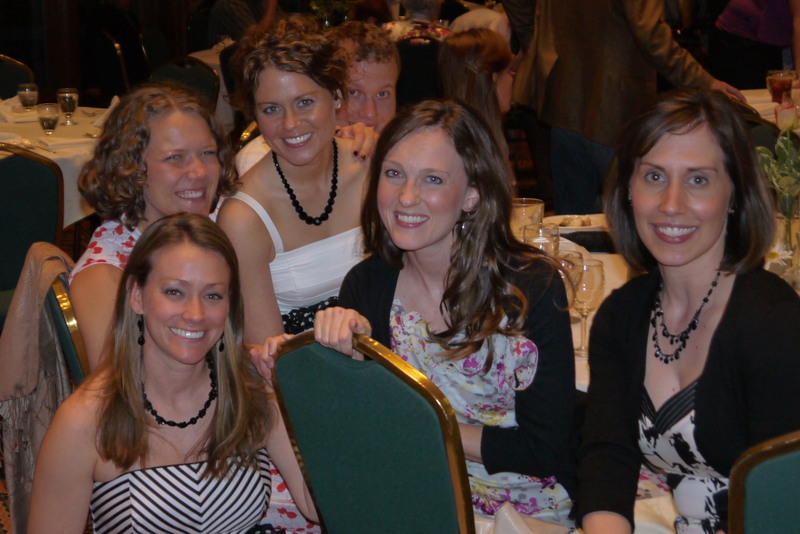 And before taking off for dinner, the five roomies got together for a picture. 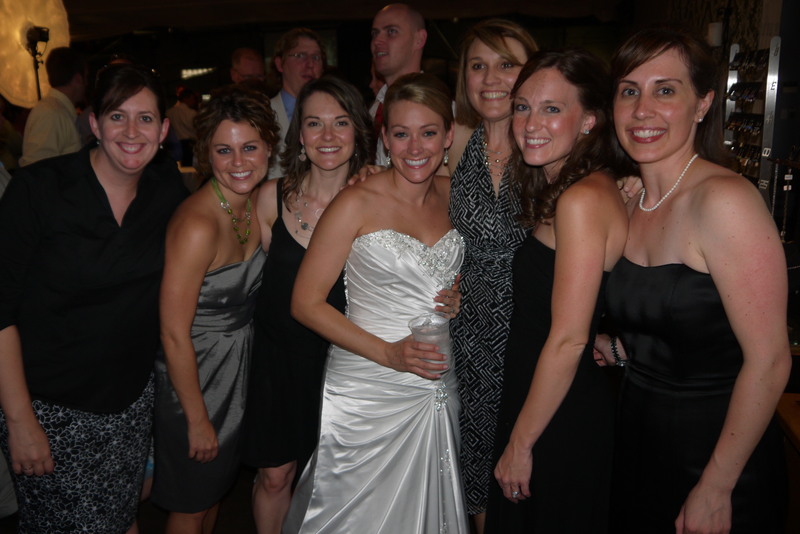 Emily, Bri, Les, me, and Allie have SO many pictures together from college and now all five of us are married!! 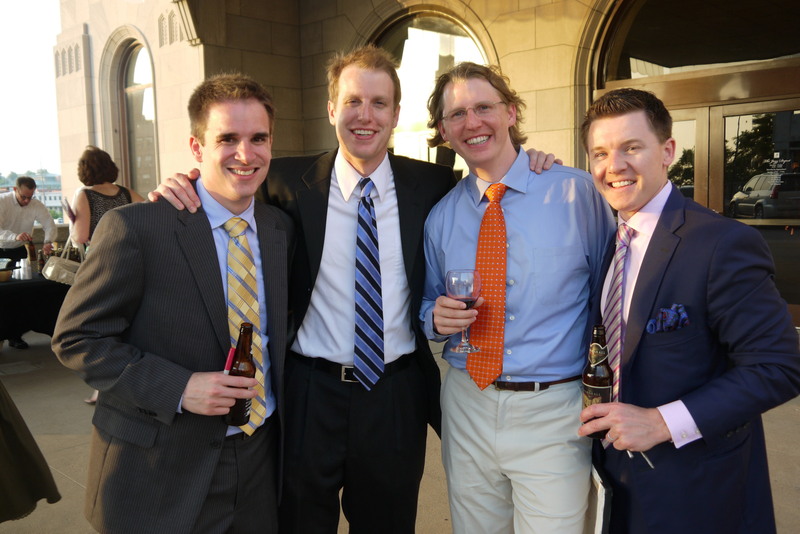 The day of the wedding was so much fun…start to finish. 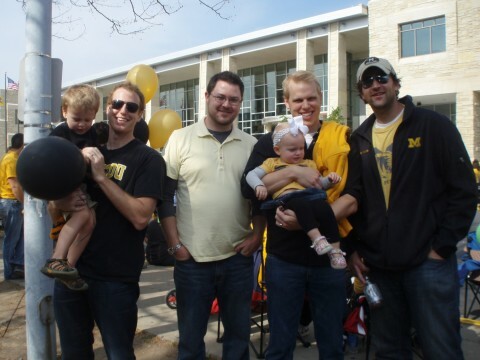 We had 26 of our college friends and their kids over to our house for a cookout that morning. It was so fun to see everybody and their families. 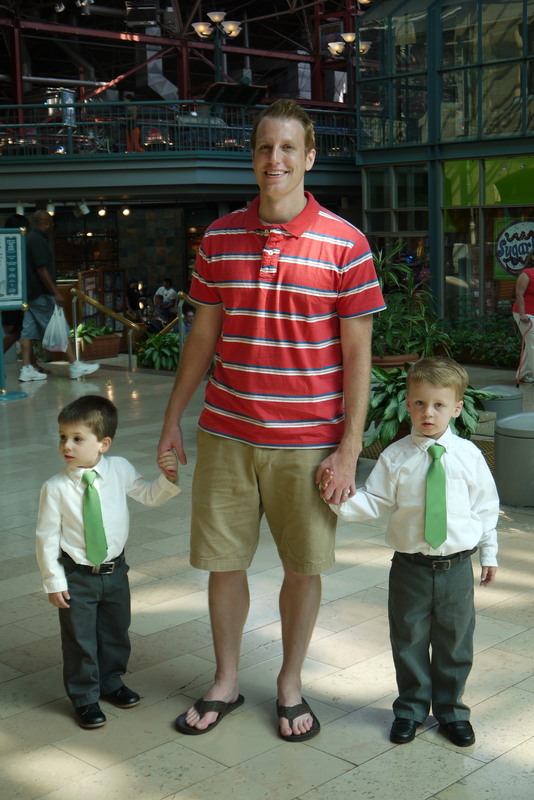 After the cookout it was time to head to Union Station for pictures. 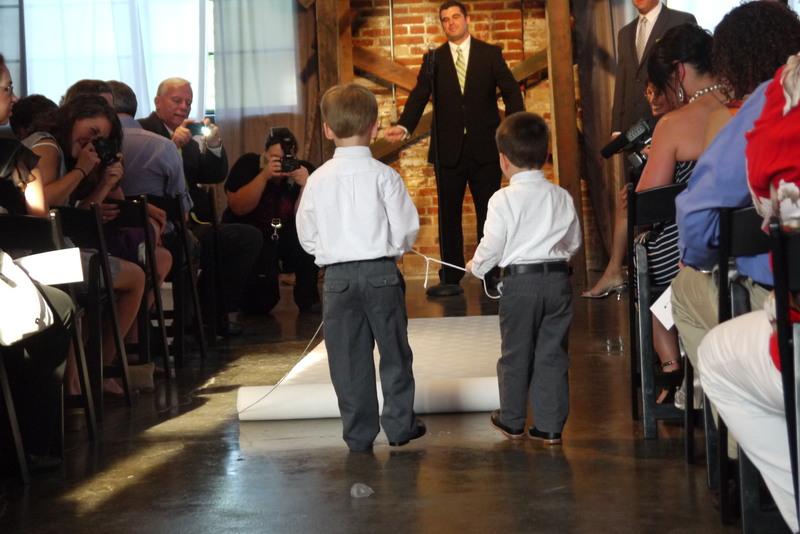 Travis kept the ringbearers neat and tidy as we tried to figure out where we needed to be. 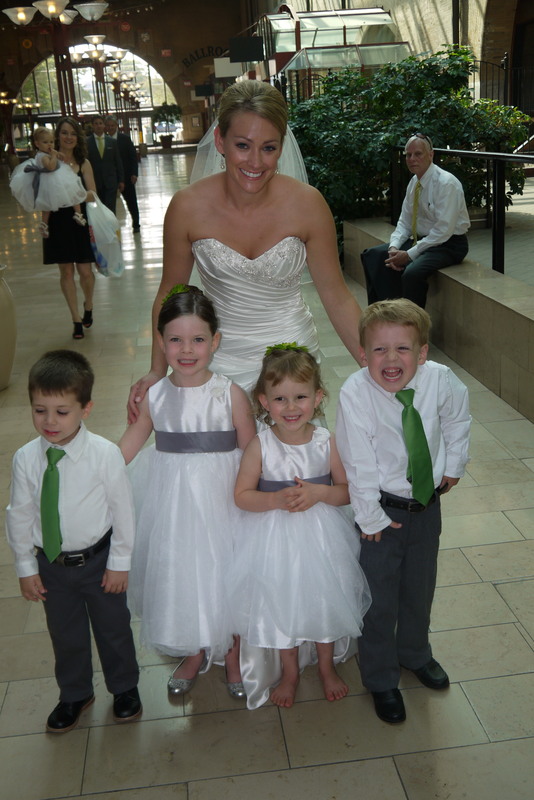 When we finally found the bride, Les took a minute to snap a picture with her troop of ringbearers and flower girls. And Owen was doing his tiger face. Nice. Flower girls, Avery and Audrey, are my friend Bri’s daughters. 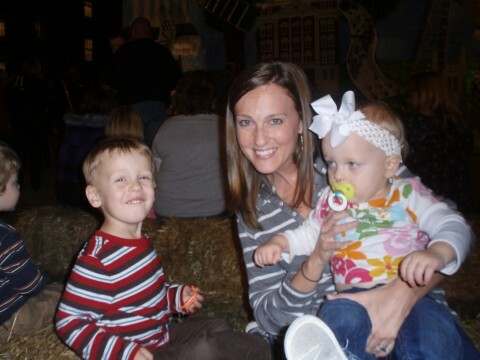 Owen had a great time with them…and became a bit of a ladies man! 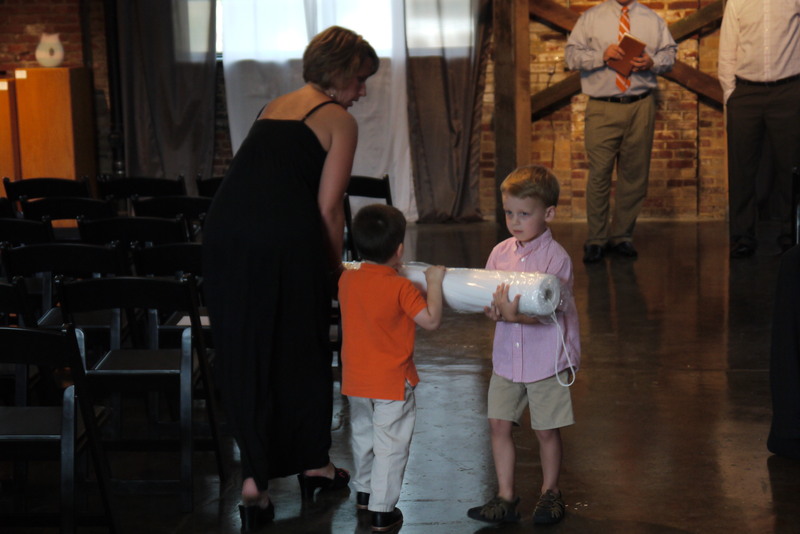 I’d mentioned earlier that Emily and I were nervous that Micah and Owen wouldn’t be able to drag the runner down the aisle without our help. We were sure that we’d be popping up out of our seats to help them out. But we didn’t need to because they did GREAT! They walked all the way down the aisle totally in step. And they couldn’t have done a better job of dragging the runner! 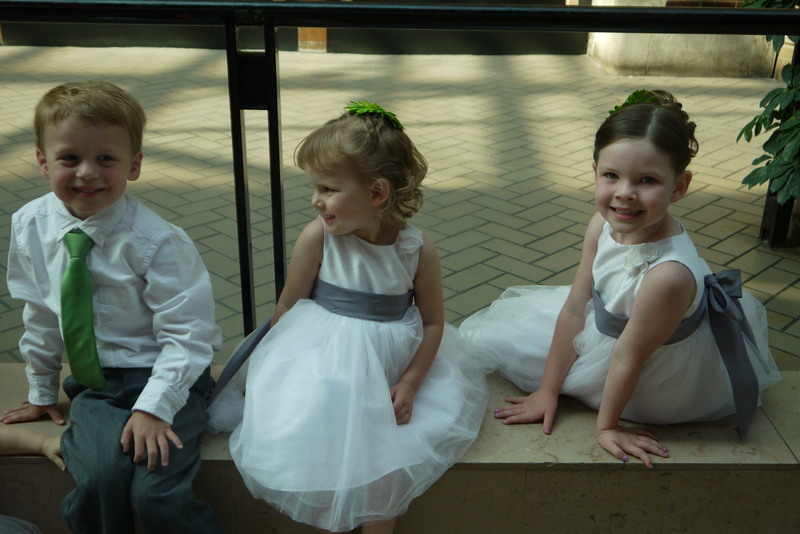 And then it was the flower girls’ turn. 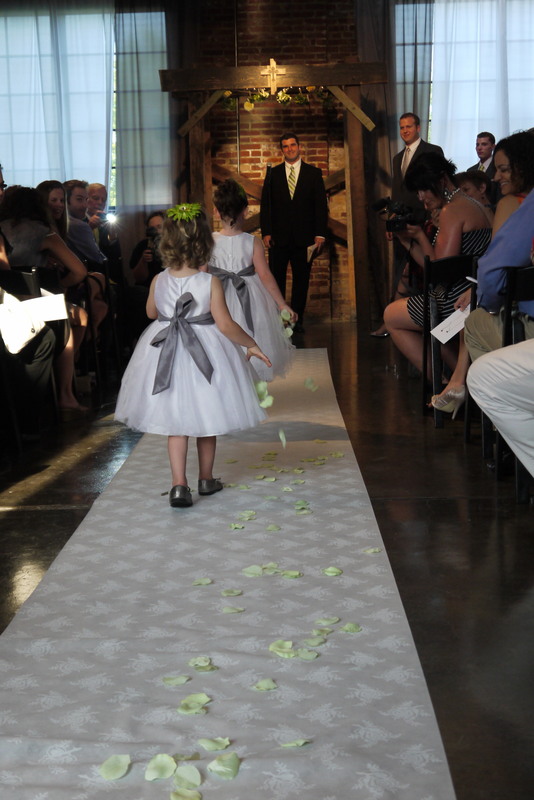 They made it down that perfectly straight aisle runner without a hitch! 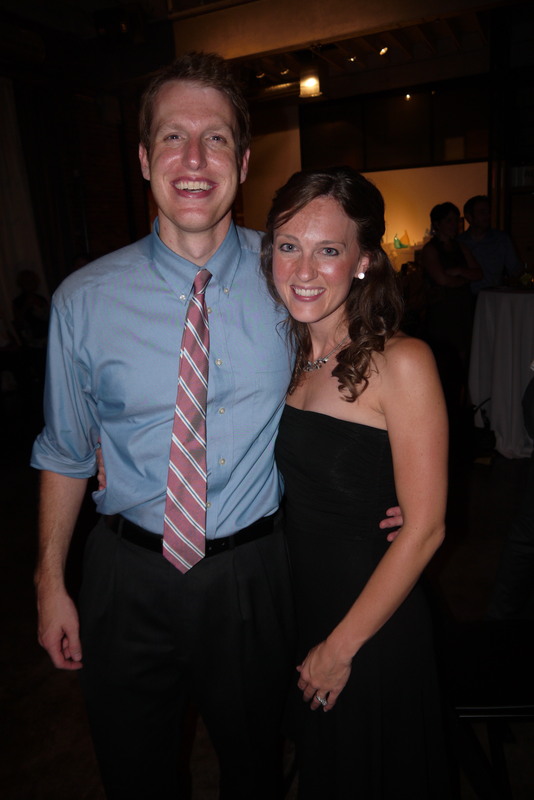 The wedding was beautiful…and then it was time for the party! Owen didn’t stay too long. His picky palate wasn’t a big fan of tomatoes stuffed with goat cheese and standing around talking to grown-ups wasn’t his idea of a good time. My parents were amazing and came all the way downtown and picked up Owen from the reception and took him home. Before he left we snapped a quick family picture. Our college Bible Study leader, Bissy, has come to almost all of our weddings. It’s been 8 years since I was in her Bible Study, but it’s always so great to see her! Trav and I celebrated our 7 year anniversary the weekend before. 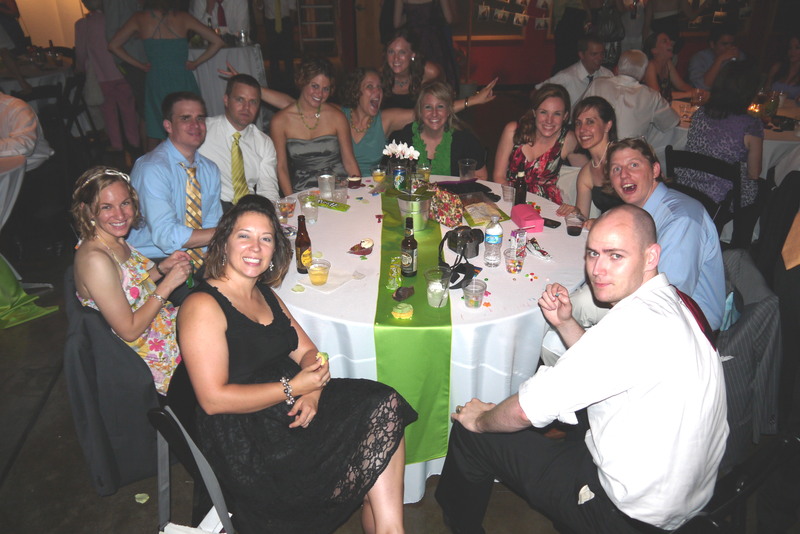 It’s crazy to think about where we were 7 years ago…so much has changed since then! Here we are…nice and shiny. The a/c wasn’t working too great and it was HOT that night. 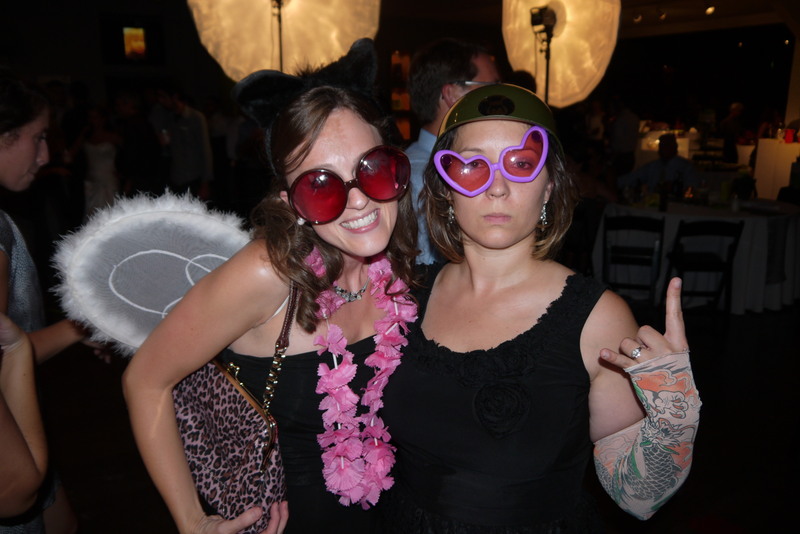 The reception was tons of fun. 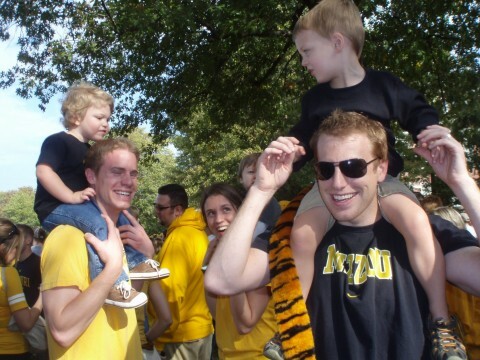 Basically Peter and Leslie provided us all with a big Mizzou reunion. 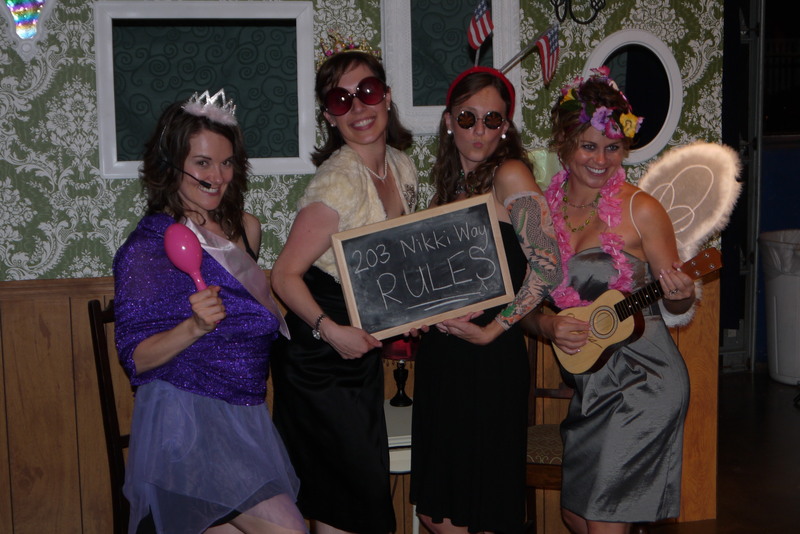 We’d tried out the crazy pictures booth at the rehearsal and it didn’t disappoint at the reception. We took our fill of pictures using as many costume combinations as possible. 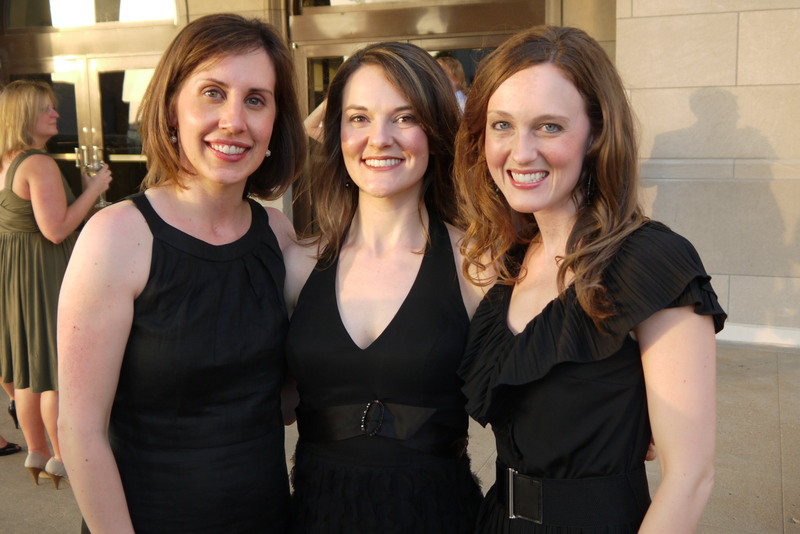 Here’s a shot of the roomies (minus the bride). Like my tatoo sleeves? I thought they were awesome. 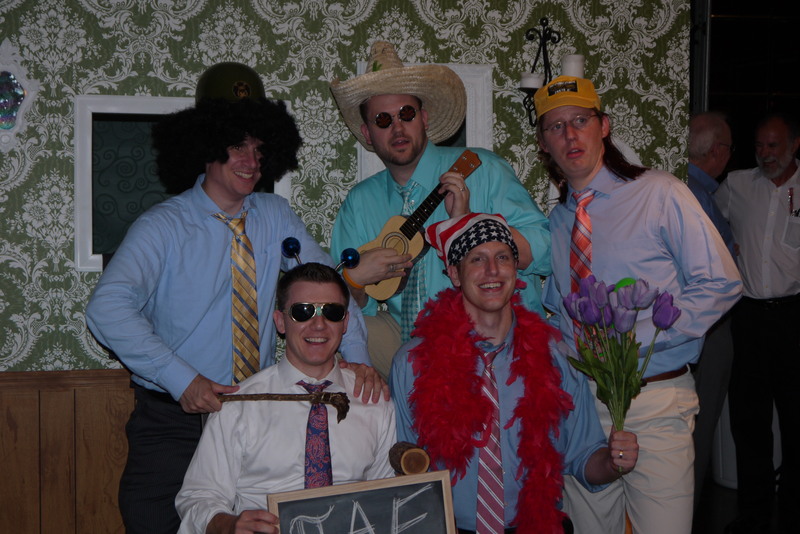 Trav and the guys in his fake fraternity “PAE…Pimpin’ Ain’t Easy”. Ask him about it sometime. Funny stuff. Tessa and I lived together for a summer and has become a close friend. 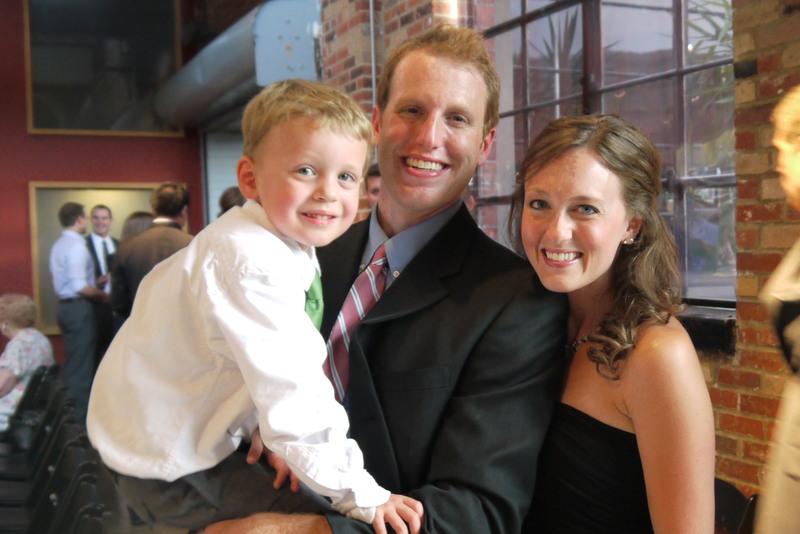 She married our good buddy, Tyler, and now we love them both! 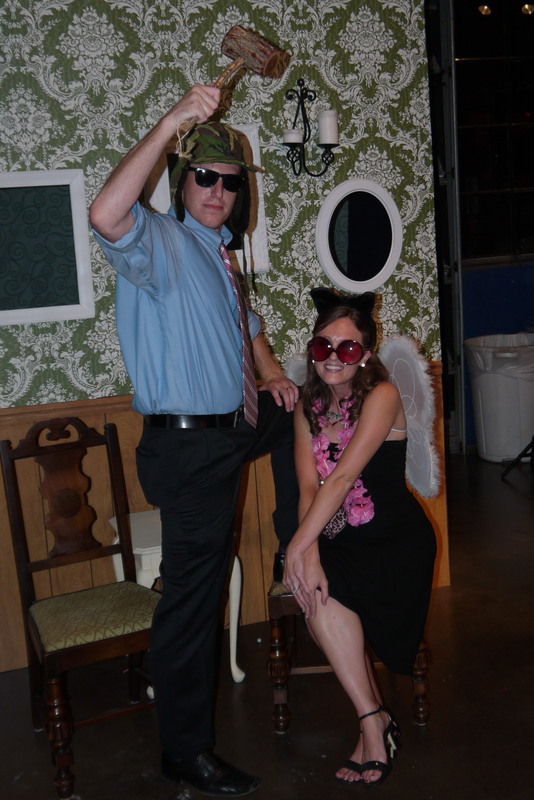 Trav and me…striking a pose in his Cousin Eddie hat and I was wearing angel wings in honor of my days as a Pi Phi angel. 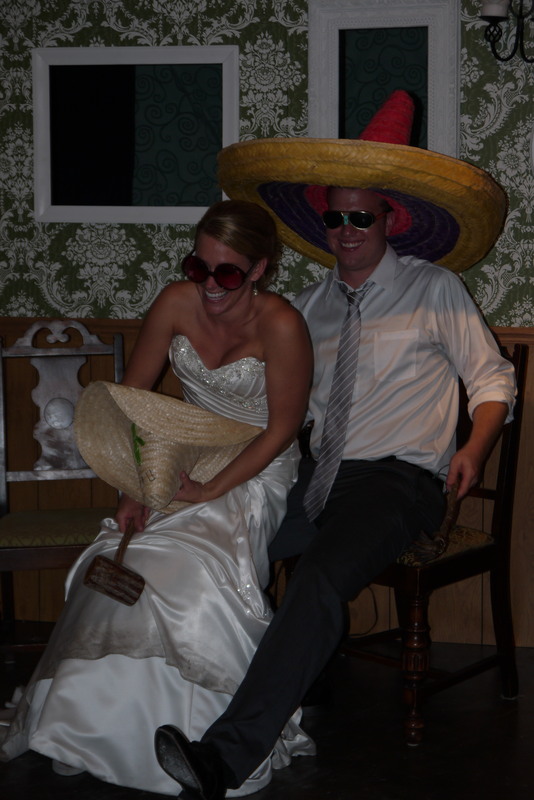 And finally…the only shot I got of the bride and groom all night. Peter and Les were headed to Mexico for their honeymoon so this picture is only fitting. Wow…that was an epic post. And I could have posted a ton more pictures. It was a great wedding. A great weekend. Great times with old friends. Now somebody else needs to get married so we have an excuse to do it again! colorado trip, part 1: tulsa!! When Trav got there, we went to lunch with a bunch of our college friends. Sitting around catching up was a highlight of the trip. Then it was wedding time! It was a gorgeous wedding on a beautiful evening. 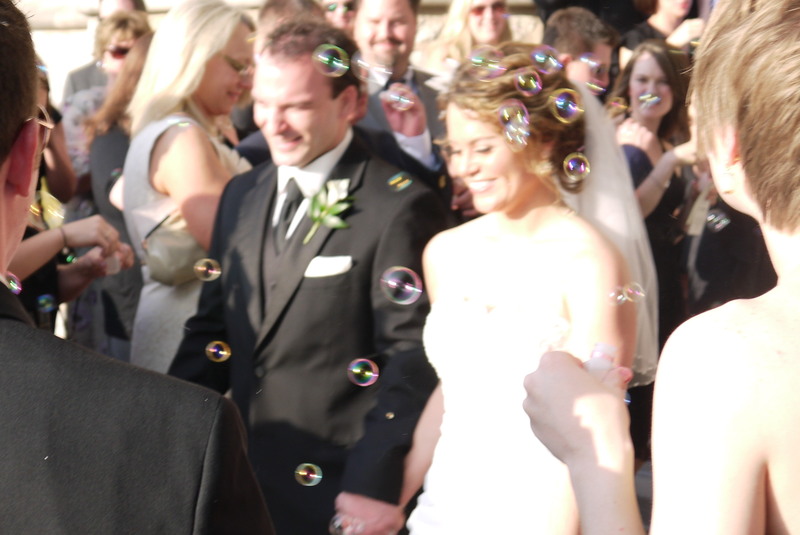 Even though it’s blurry, I love this picture of Allie and Wyatt as they left the church. Before the wedding, the girls and I had to be at the church for pictures. This left the guys with time by themselves…to get into trouble. There happened to be a local art fair going on in downtown Tulsa. The boys found this beautiful piece of art and felt it necessary that Allie and Wyatt own it for their bedroom. We all signed the back and proudly presented it to them at the reception. They were good sports. Allie is used to this kind of humor since she knew us all back in college. Wyatt didn’t know what he was getting into when he invited all of us to his wedding. Besides giving them an inappropriate painting and taking a pictures with it, my old roommates and I got a picture together (minus one…Bri!). 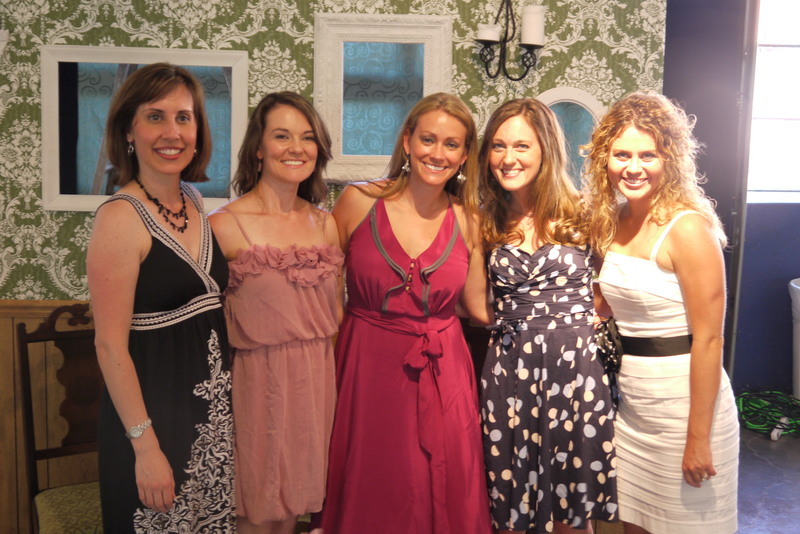 The five of us lived together in college in the Pi Phi house and then off campus for a couple of years (some more than that!). 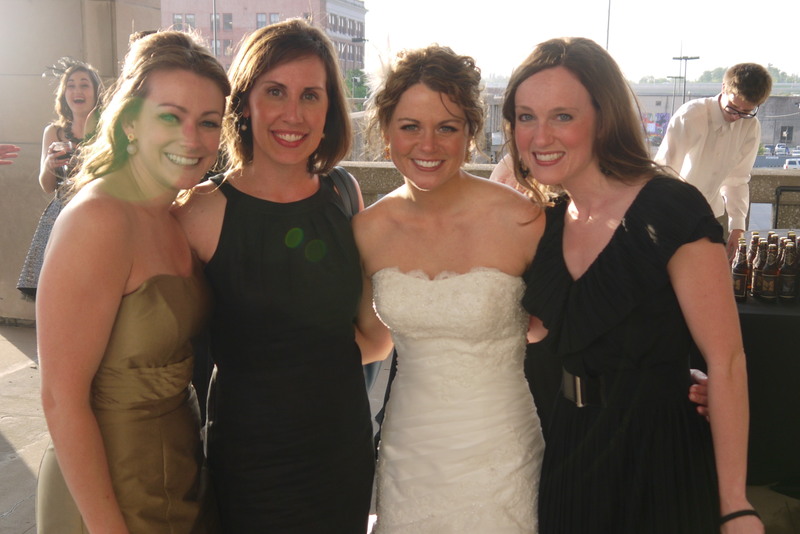 Here we are: Leslie, Emily, Allie and me (and Les is getting married in July so we get to do this all again in a couple months!). Allie’s a big big fan of cake. 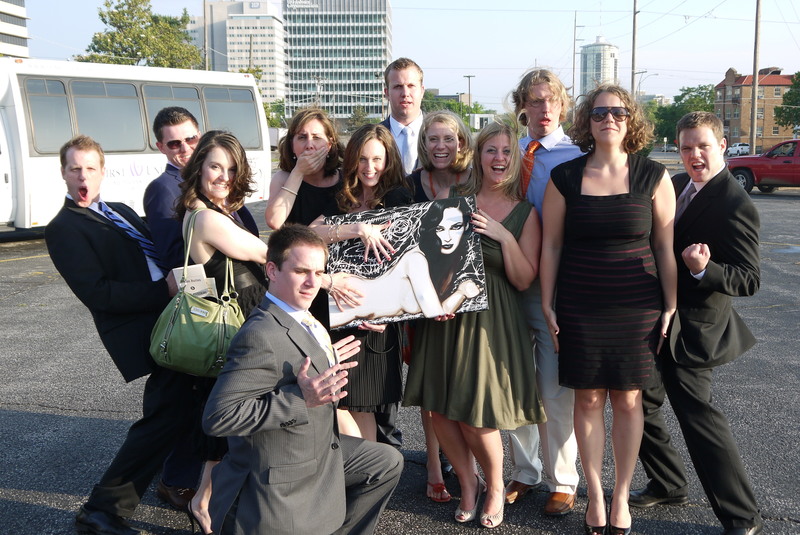 In fact, she told us that she didn’t want to see anyone the day after her wedding…she just wanted to eat cake all day. She wanted us to seriously look at her cake because she loved it so much. 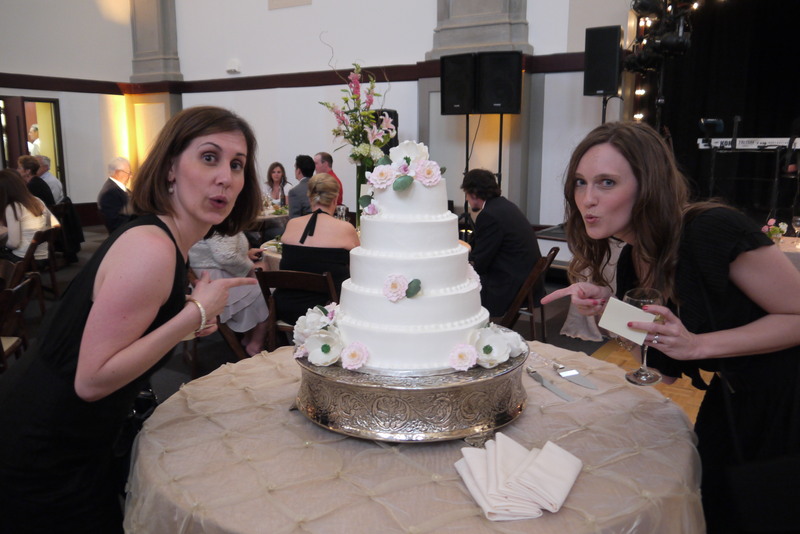 Allie, here’s your proof that Emily and I checked out your cake. 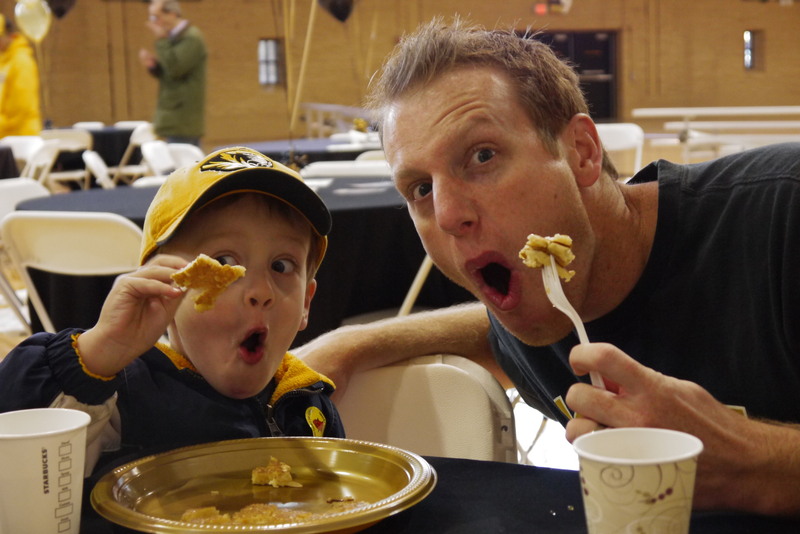 And we loved it…that cheesecake filling was to die for. My only complaint…they cut the pieces too small! 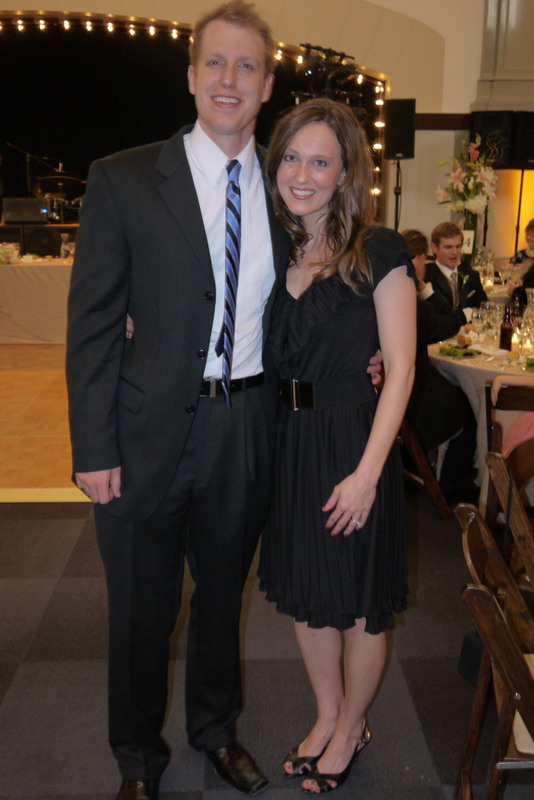 The wedding was a blast and we danced the night away. It had been a while since we’d hung out with our college friends so we made the best of it. Staying up until 2am hadn’t happened in a long while. We had so much fun and wished it could have lasted longer! 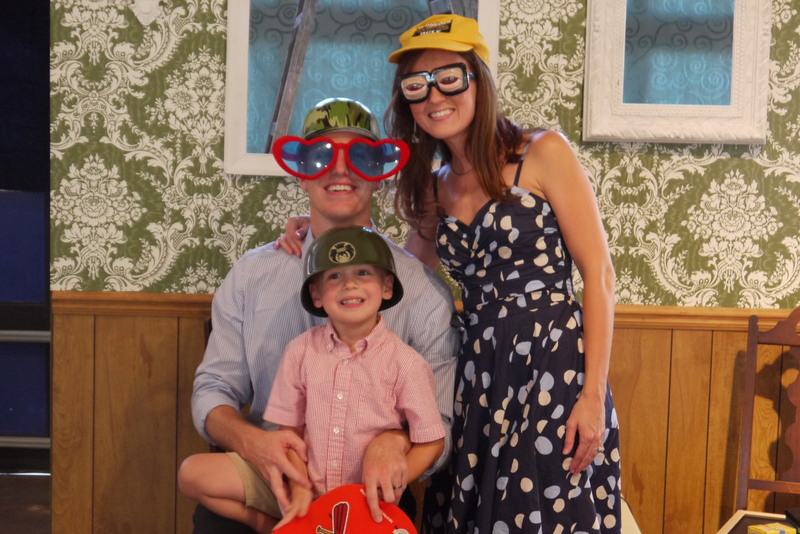 I’m already counting down to Leslie and Peter’s wedding in July (where Owen will be making his third debut as ring bearer!). Stay tuned for more posts from our Colorado trip…there are SO many pictures it will definitely need several posts! 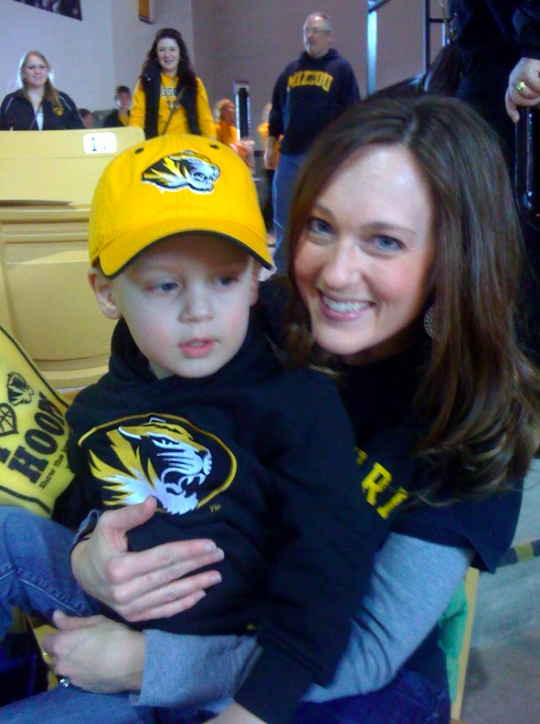 Part of Owen’s Christmas present this year was a date with Mommy and Daddy to see a Mizzou basketball game. 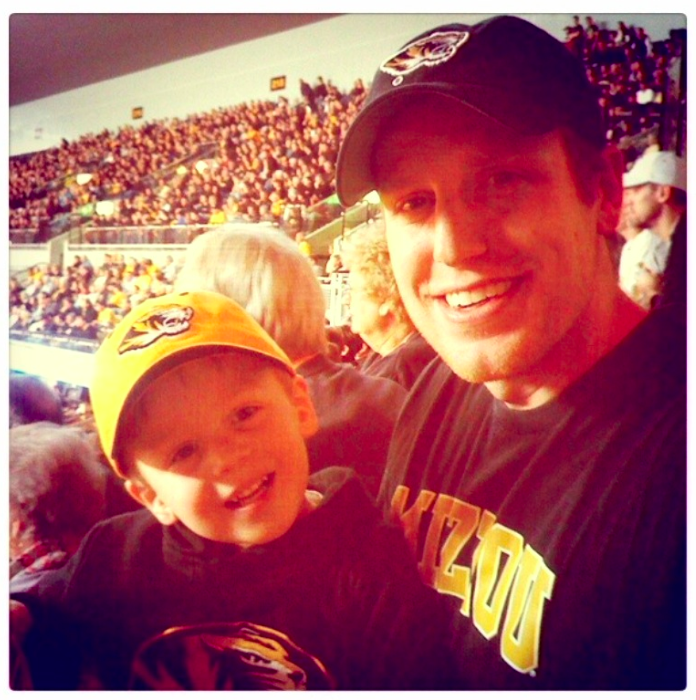 We bought tickets for the Mizzou/Oklahoma game on February 12 and had a perfect day with our son. 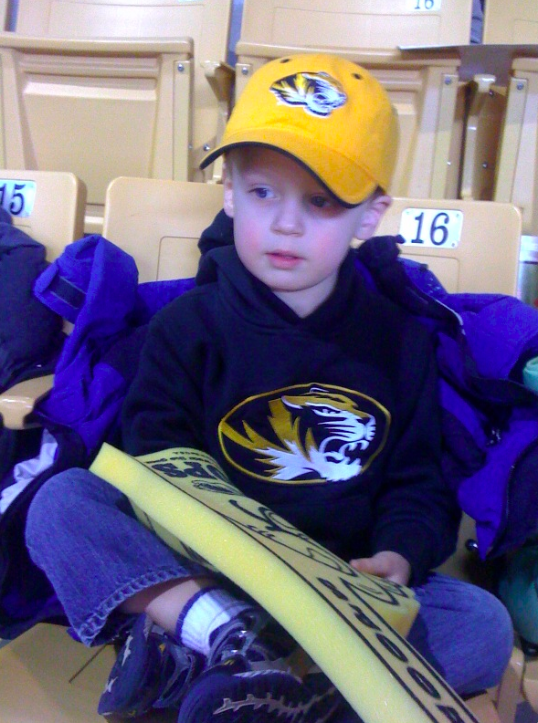 We started the day by taking him to the Mizzou bookstore where we got him this totally awesome Tigers hat. He loves it and wants to wear it all the time. Still. And it’s been a couple of weeks since the game. As we were getting ready to pay he saw the foam finger and HAD to have it. He proudly carried it to the game and pretended it was a gun and used it to shoot people in the stands. 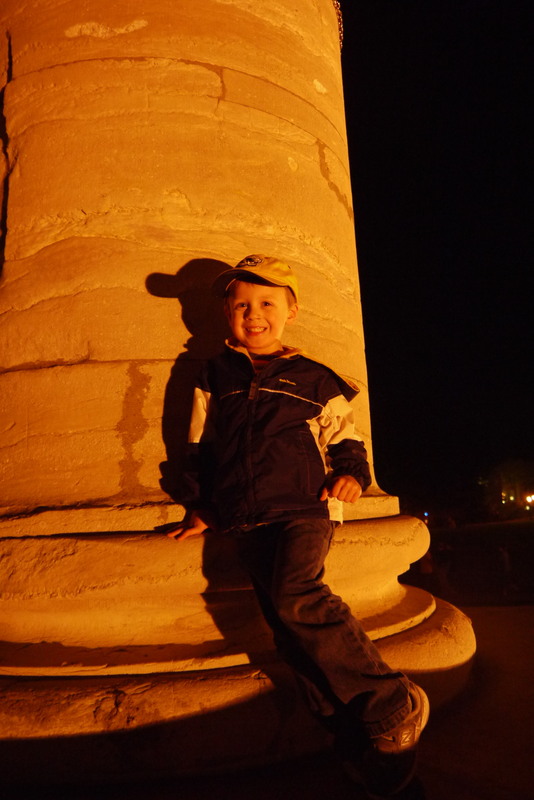 What can I say, the kid’s obsessed with soldiers, army guys, and battles. It shouldn’t come as a surprise when I tell you that Owen’s favorite part of the whole game was when the ROTC guys came out during halftime. Real live soldiers!!! Owen was thrilled. He got his $30 worth right there in that moment. 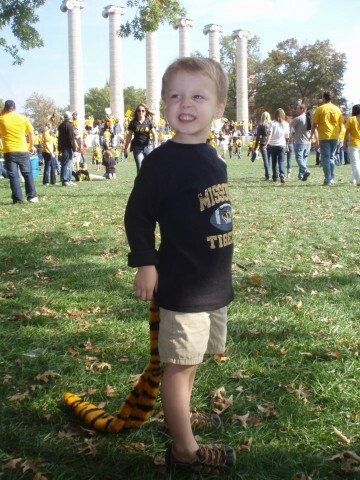 The Tigers made our day even better by giving us a win! The time with Owen was great. The game was fantastic. And being back on our old campus with our kid is kind of a surreal experience. Best day of 2011 so far. That’s Kevin and me. My roommate from freshman year. And sophomore year. And junior and senior year. 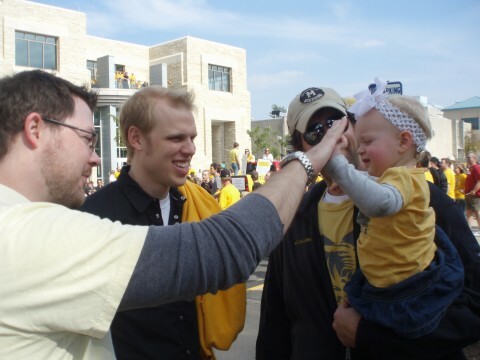 For four years we talked music, explored the fine establishments of Columbia, MO, and missed countless high-fives like the two gawky white kids we were. 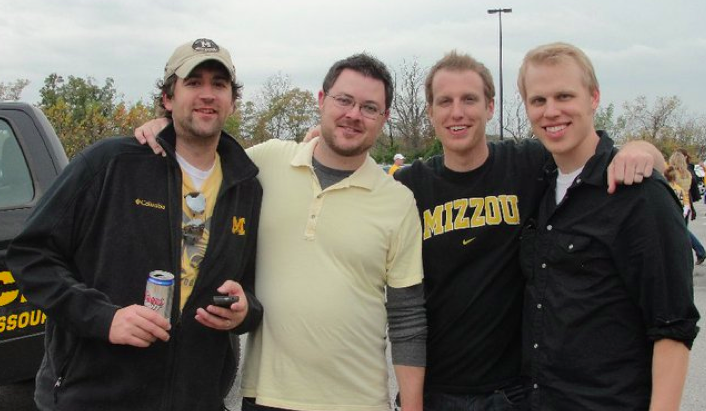 We also loyally sat through countless average football games, including a few good ones. 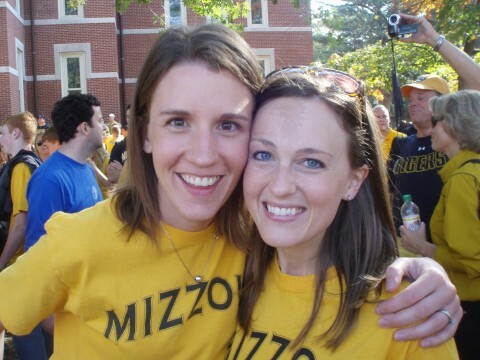 But unfortunately we lost all of those good ones (this was pre-Brad Smith greatness and the Chase Daniel era) – which made seeing Mizzou beat Oklahoma for the first time since 1998 (when they were ranked #1 in the BCS, no less!) all the better. The Tiger defense made huge plays. The offense looked great on the ground and in the air. And both sides of the ball looked spectacular in the 4th quarter. I’ve never heard a crowd louder, and Kevin and I were doing our part to add to the hysteria…and that included, no joke, a missed high-five. I guess some things don’t change. 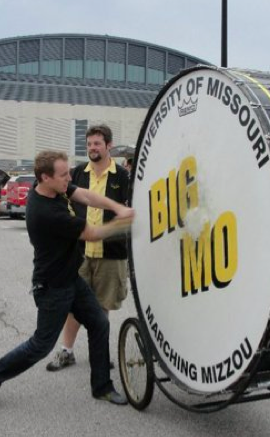 I even got to bang Big MO, a staple at every Mizzou game, which just so happened to be making the tailgate rounds. Look. At. That. Form. The game, the reunion, the time with Emily and the kids beforehand…well, let’s just say it made for an unforgettable weekend. The Tigers have Nebraska this weekend, with the chance to go 8-0 and control the Big 12 regular season. 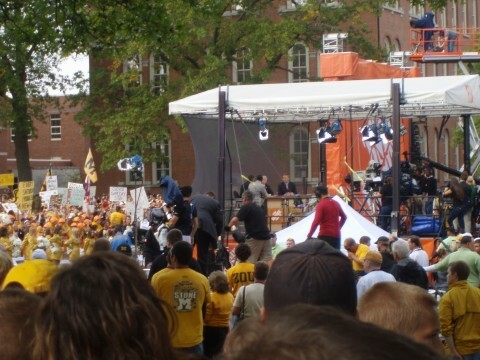 Even if that doesn’t happen, it won’t take away from Homecoming 2010.